Water diverted from the Mississippi River spills through a bay in the Morganza Spillway in Morganza, La., May 14, 2011. 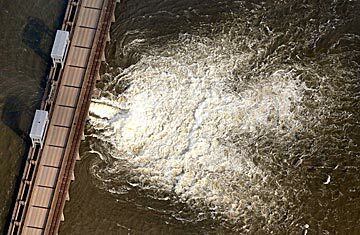 It seemed, on the face of things, to make sense: The first gate of the Morganza Spillway opened on Saturday afternoon, sending 10,000 cubic feet of Mississippi River water churning south toward the Atchafalaya Basin, all part of a concerted effort to help relieve pressure on burdened levees protecting Baton Rouge and New Orleans. By late Sunday morning, a total of four had been opened. But Bayou residents can be forgiven for wondering just how well-conceived the Army Corps' latest plan is, no matter how many mathematical models have gone into it. After all, the river crest that wasn't supposed to hit Baton Rouge until May 22 is now scheduled to arrive on its doorstep Monday, albeit two feet lower than previously anticipated. And though there have been reassurances in recent weeks that the region's levees would hold, locals do wonder what would happen if a barge broke free and slammed into one of these stressed floodwalls mere months before hurricane season were to begin. Before the Morganza was opened on Saturday afternoon, in fact, 25 barges drifted loose on the Mississippi River in Baton Rouge, two of them slamming into an bridge. The barges have been corralled and the bridge has been reopened, but as the Army Corps moves water away from New Orleans and Baton Rouge, it's clear that concerns about this stretch of river will remain as high as the water levels for the next few weeks. "I think [the Army Corps has] been guessing," says Nick Romero, a 62-year-old retiree who lives in Bayou Corne, a tiny fishing hamlet an hour and a half south of Baton Rouge. Bayou Corne is expected to get up to five feet of spillway water within the next few days, but Romero isn't leaving his house. Right now, he's filling sandbags, deciding whether to wrap his furniture in plastic and telling his wife she needs to clear out before the electricity fails and the water gets too high. The water level is currently about three feet under his front porch, but rising one inch a day, he says. Water from the Mississippi River is racing towards Romero and the Atchafalaya Basin, where it will flow past Morgan City, an oil and seafood community of 12,000, and then into the Gulf of Mexico. About 25,000 people and 11,000 structures in this threatened stretch of land could be affected by the oncoming water, according to state officials. Some people have already evacuated, but others are in the process of doing so, or are waiting until local police tell them to leave. "The Army Corps of Engineers has been telling us to activate our plan and do what we need to do," Romero says. "First they tell me I'm in a 0-5 foot flood area and that I shouldn't worry. Now they tell us we shouldn't get more than two and a half feet. So they don't know. They're just guessing. So I'm preparing for two and a half feet and hoping I don't get more than that." None of this sits well with Romero's 40-year-old daughter Angie Bueche, a special education teacher who lives in the Baton Rouge area. Bueche thinks her father is crazy for not packing up his things and leaving with his wife. After all, she points out that if you sit on the front steps of her father's 2,200-square-foot house, you're looking straight at a canal. That water makes her uneasy, she says  as does her dad's stubbornness. "And on top of that, what if he's there all alone and has a medical emergency?" Bueche says. "He wants his trucks moved out, so the only way he'd be able to get anywhere is by boat." Bueche drove down to her father's house on Saturday. She brought him 2-liter bottles and other empty containers that were filled with clean water, just in case his water supply was contaminated in the coming days. "Again, I am concerned," she says with a catch in her voice. "I'm still a girl and this is my daddy we're talking about. It's not just that the house is going to flood. It's that this won't end when the water goes away. There's an aftermath that people will have to deal with and it's hard to see people go through that kind of hurt." Romero bought land down in Bayou Corne 20 years ago, first using it as a fishing camp, then deciding with his wife, an artist, that it was an ideal place to build a house and retire. "We go fishing in the Atchafalaya together," he says of his life with his wife. "And when we're there, I collect driftwood out of the spillway, take it home and clean it so she can paint wildlife scenes on it." When Romero first purchased his property, it never occurred to him that he'd be facing racing waters from the Morganza Spillway like he is now. All he thought about was the fishing, he says. Now he is thinking about what might come his way in the next few days. Whatever it is, he has his cell phone ready. He has his radio. He has a generator and seventeen and a half gallons of gas. And he has a little something waiting for any looter that might try to take advantage of a bad situation. "Everybody down in Louisiana hunts, so we all have guns," he says. "And I have a .22 pistol, a .22 rifle, a 12-gauge shotgun, and a .270 Remington, so I think I'm covered."